The borders of modern Namibia were drawn up on a map at the Berlin conference of 1884, named of South West Africa, and given to Germany as a colony. The germans ruled it from then until 1915, when it was invaded by South African troops during the First World War. Namibia. The sticky-out bit at the top (Caprivi Strip) was because the Kaiser (german king) wanted his colony to have a view of Victoria Falls. During the period 1884-1915 the Germans built farms, exploited the county's vast mineral wealth, and drove the indigenous population off the land wherever possible. Many settlers arrived during this period and they did their best to re-create their homes, building faithful reproductions of german houses in the deserts of southern Africa. Many of these buildings followed the traditional style of the German Alps, with steep roofs to prevent the snow piling up, something of a rarity in the area, but a popular tourist attraction a century later. 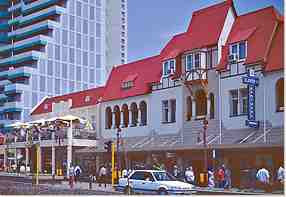 A row of historic shops in Windhoek, Namibia, with steep roofs to prevent snow accumulation, combined with an open bar on the roof of one building. 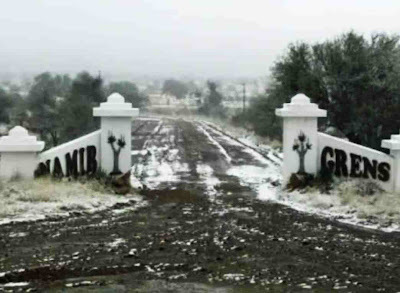 In June this year (2011), snow did indeed fall in Namibia. Images of this snow quickly made their way onto the internet, leading to much speculation around the globe, and the emergence of some interesting theories online, which can be quickly ran through. 1) This is a sign that the end of the world is immanent, as prophesied in the Book of Revelations. Basically we're all doomed, though there are a few religious organizations (or at least organizations which claim to be religious) offering salvation in return for large, and prompt, cash donations. 2) This is a sign that the end of the world is immanent, as prophesied in the writings of the ancient Mayans. Unfortunately the ancient Mayan priestly class are no longer with us, so it is unclear if they could have offered salvation in return for cash, or anything else. What we do know of their religion suggests that they may have thought a human sacrifice on top of a large pyramid was worth a go. 3) This is a sign of global warming, normal weather patterns are breaking down and freak weather events are becoming more likely. This is certainly a lot more plausible than either of the previous explanations, and there certainly has been an increase in freak weather conditions in the last few years, which may well be linked to global warming. Yet while climate models used to predict the outcome of various warming scenarios do predict a wide range of extreme weather events becoming more common, I am not aware of any that predict snowfall in the Namib Desert. From a scientific viewpoint just saying 'more freak weather' conditions is not very satisfying, this is just invoking the bogeyman to explain anything we don't have an answer for; as a scientist one should look for more direct explanations. 4) This is a sign that global warming is not happening, all climate science is complete hogwash, and we cannot predict the weather in any meaningful way. There will always be weather events that happen outside our expectations, and we should stop worrying about it. This is more of a political viewpoint than a scientific explanation, it rejects an explanation that its adherents do not like, but offers no explanation for events, indeed it rejects the idea that we should look for explanations - profoundly unscientific. 5) It snows in Namibia, this is not a freak weather event, but an uncommon one, entirely within Namibia's normal conditions. Actually it does snow in Namibia from time to time (the last snowfall was in 2006), but this is a rare event. and there is only ever a light sprinkling, never enough to collapse anybody's roof. 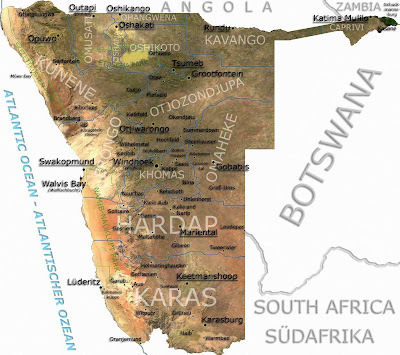 Namibia has a subtropical climate with two seasons; a short, hot, wet season, and a longer, cooler, dry season. The wet season is to hot for snow, and the cool season far to dry (and as a rule, still to warm). So the snow still needs a bit of an explanation. The snowfall in Namibia, not actually that dramatic. So if snow in Namibia is an unusual event that requires an explanation, then it is logical to look for other unusual events that happen at roughly the same time. This year has seen a number of dramatic weather events, from floods in Australia to tornadoes in New England, but these are effects rather than causes, and, unlike the Namibian snow, they are all events that have been predicted by the models of climatologists studying global warming. There have also been earthquakes in Japan and New Zealand, but again it is difficult to see how these could cause snow in Namibia. More interestingly there have been two significant volcanic eruptions this year; Grímsvötn in Iceland and Puyehue kin Chile. Grímsvötn is in the northern hemisphere, too far from Namibia to have had any significant effect on the climate, but Puyehue is ideally placed to cause precipitation in southern Africa. Volcanoes are not obviously wet objects. We associate them with ash and heat, but volcanic plumes actually contain a considerable amount of water vapor. The volcanoes of South America are fed by the subduction of the Pacific Plate beneath the South American Plate. As the waterlogged sea-floor is pushed deeper it is warmed by the internal heat of the Earth. This eventually forces the water out of the sinking crust, and it rises up through the overlying South American Plate, carrying superheated liquid rock with it. Eventually it emerges in the Andes, forming volcanoes such as Puyehue. This superheated water vapor explodes far into the atmosphere, carrying the more obvious volcanic ash with it (gaseous water vapor is invisible). Once this reaches the upper atmosphere it is carried eastward by the Earth's motion (the ground rotates more rapidly than the upper atmosphere, so anything in the upper atmosphere is carried eastward). The majority of the Puyehue plume has passed to the south of Africa, eventually traveling round the world to disrupt air travel in Australia and New Zealand, but enough material has spread over southern Africa to have an effect (there has been snowfall in South Africa as well, but this is less unusual, and so has escaped comment). In addition to the water vapor the volcano will have produced significant amounts of sulphur dioxide (SO₂) into the upper atmosphere. This (in addition to other effects) acts as a cooling agent, facilitating but not guaranteeing snowfall. As a theory this is all very well, but to make a strong association between volcanoes in South America and snow in Namibia we would need more than one example. The last time it snowed in Namibia was in February 2006, this time during what should have been the warmer season. This was a month after the onset of volcanic activity at Galeras Volcano in Chile, hundreds of kilometers to the north of Puyehue. An areal photograph of the Galeras caldera. 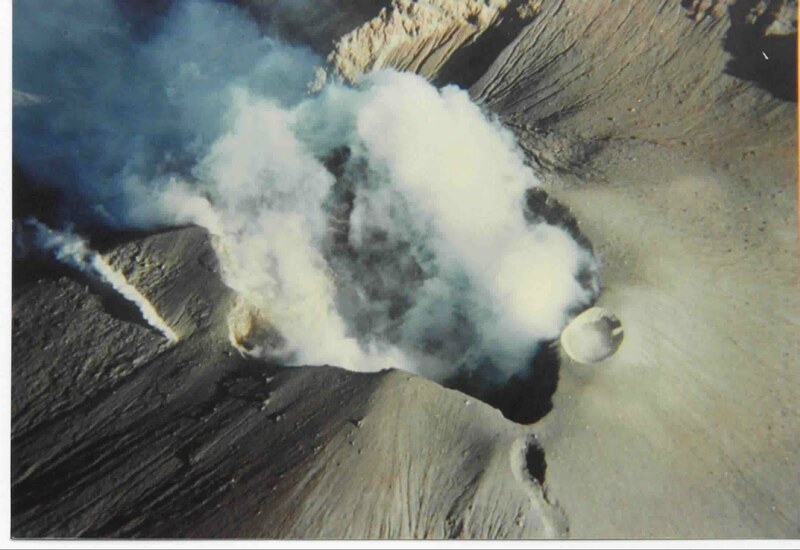 To the lower right a smaller plume comes from a fumarole, a small vent through which only gas escapes. Unfortunately I do not have details of every recorded snowfall in Namibia at my fingertips, so I am unable to check them against volcanic eruptions in South America, however the small sample have been able to check suggests that snow in Namibia is usually preceded by volcanic eruptions in South America, although the reverse is not true; not every volcanic eruption in South America leads to snowfall in Namibia. The Puyehue Eruption, Chile, 2011. With the internet as big and far reaching as it is today everyone should start thinking about having some sort of online presence in order to keep up with the changing methods of buying and selling.